Delilah is a true pioneer of belly dance in America. Beginning at 18, she studied with many of the first, great, m odern, American belly dance instructors — Sheherazade, Marta Schield, Jamila Salmipour and her many protege, Dalena. These women laid the foundations for the practical study of Middle Eastern belly dance movement that swept across the country. Soon the dance would uncoil itself to become the strong, enthusiastic, long-standing industry it is today. Delilah became a seasoned dancer performing six nights a week, two to three shows each night, with fine live Middle Eastern bands in the ethnic restaurants and night clubs of Southern California, as well as those in Seattle, Washington. These ethnic familial associations with music, culture and tradition would broaden and mentor her understanding of the dance and it’s diverse heritage. Delilah was deeply engrossed in the multi-cultural experience of the dance. She also was very young, very American and very creative. She regularly experimented and always questioned and researched the past progressions of dance, as well as pushed onto forward frontiers.Delilah studied with a variety of artists: Sarah Tefanov, Laurel Victoria Gray, Gabriel Roth, Sheik Jelladine Loras, as well as several multi-ethnic musicians. She soon began teaching and traveling around the world, disseminating her unique style and perspectives of the art. She has been noted for her vast knowledge of the technical applications of the physical dance: exacting isolations, exceptional belly rolls, gymnastic floor work, veil dance, night club style, and folkloric as well as Phaoronic style dances. Delilah also received notice because of her uncanny ability to transfer a dance element beyond technique, deep into the realm of soul and spirit . . . most likely because she had a lot to say with the dance. She demonstrates the rare temperament of an inquiring artist. It has always been important to Delilah to impart the multifaced values of the dance, side-by-side with the technical aspects. She spearheaded many new chapters in the ongoing story of American belly dance. As part of her career, Delilah dedicates herself to the deep pursuit of understanding the meaning and art of belly dance. She finds connections, clues and answers in Jungian archetypal symbols, and in elements, myth, nature, ritual, body language and right brain-left brain correlations. Delilah has organized many experimental dance projects, on stage or in natural outdoor settings, utilizing dancers and live music in places such as Hawaii, the Northwest Rain Forests, Costa Rica, the Eastern Sea Board, and temples in Egypt. She documented her work in a written paper delivered at the first International Conference for Middle East dance at OCC college in May of 1997. She also won first place in a literary contest on National Public Radio’s Living on Earth program in 1994. She has produced 22 retreat study programs, in Hawaii, California and Washington, based on these experiences and her teachings. Delilah has invented her own non-traditional applications for belly dance; these works function as dance studio exercises, women’s circles, and ritual celebrations aimed at personal growth and healing. They include Veil Therapy, Prayer to Ishtar, The Mirror Dances, Grounding and Centering Rituals, Hathor’s Movement Meditation, Belly Dance Obstacle Course, Community Zahr and many others. . . They have been passed on to dancers all over the world. In the 1980s, a rise of feminine consciousness hit the air and women internationally were inspired to explore a new psychology derived from Goddess imagery and archetypes. Authors such as Jean Shinoda Bolen, MD, Robert Graves, Joseph Campbell, Starhawk, and Barbara Walker inspired women to ritualize and celebrate the sacredness of women; women=body=vessel=life (Robert Graves). These inspirations, of course, were a perfect match for a dance born from women since time immemorial in search of meaning. Delilah gained a natural reputation as a Goddess Dancer emerging from these elements. As if she would stop there! Delilah’s true view point was much more varied than this title denoted. She pursued yoga, Sufism, Tai chi, and all styles of Middle East dance and energy works. Delilah created a historic dance in her third trimester of pregnancy. “Dance to the Great Mother” was performed in a handful of city’s across America, in 1984-85. The power of this dance was recognized as exceptionally important for providing positive images of pregnant women in our world society. Delilah received grant money and resources to record the dance on video before time ran out. To this day, 25% of the profits from the video go to Birth and Life, women’s shelters and the March of Dimes. This production still stands out as a unique work honoring creation and birth, and is constantly referenced in books and journals around the world. 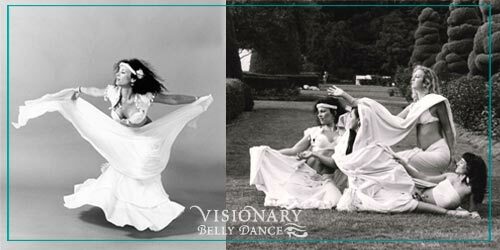 See a belly dance movie from Visionary Belly Dancing. Early in her career, Delilah began exploring the use of belly dance as performance art in settings other than night clubs, such as museums, galleries, community gatherings and theaters. She began collaborating closely with artists of other mediums, as well as interfacing with other sectors of the community. “Faces of the Mother; Phases of the Moon” involved four dancers, a musician and a visual artist. This led to a collaboration between artist and ritualist Sarah Teofanov, musician Steven Flynn and Delilah called ”Calling up the Oracle .” The piece was originally commissioned for a joint presentation at Washington State University, in Pullman, Washington. A second work followed called ”Calling up the Oracle for Peace“ which also included large groups of women in Seattle, Washington, Taskent, Uzbeckistan, and Soviet Georgia as part of an artists’ for peace exchange brought about through Laurel Gray and the Seattle Sister City Committee. It has been performed multiple times in the U.S. and what was then the Soviet Union. By 1997, Delilah was presented the first IAMED (International Academy of Middle Eastern Dance) award as belly dancer of the year. She had produced one of the longest standing internationally acclaimed Instructional video series on the art of belly dance. Today, she has 15 titles in VHS and DVD. She also has 20 edited documentary videos that are not for sale, but are part of the dance science and research she conducts for her work. She is well known for her 10-day Visionary Belly Dance Retreats set in Hawaii. Since 1992, women have come from all over the world to study belly dance with Delilah, her guest instructors and a group of talented musicians. On this truly unique Instructional/Performance production you are invited to enter either the DVD Theater, to enjoy a recording of a live performance at the Iao Theater, or Delilah’s Dance Studio where a fast-paced intermediate choreography is taught utilizing over 45 movement combinations taken from the live performance. Three separate artist commentaries accompany the program. It also comes with a membership to a companion Web Club where students can find additional information on the subjects covered, along with printable resources. This is truly one of the most intriguing Web sites on the Internet featuring video clips, sound files, unique photo galleries (Underwater Belly Dance Gallery), a regular column for Belly Dance as healing Dance moderated by Lorraine Lafata, a Biographical Web Book on Visionary Dance Productions’ featured musician, Steven Flynn, with over 60 articles, stories, notes and reviews. There is also on-line shopping for belly dance DVDs, videos, music, costumes and much more. Since 2005, Delilah has owned and operated Visionary Dance Production (VDP) Studios in Seattle. (206) 632-2353 or (206) 632-1906VDP Studio holds many weekly classes and guest star workshops. Delilah can be seen performing with House of Tarab, a 6 piece Middle Eastern music ensemble. She enjoys working with award winning dancer Dahlia Moon and her daughter Laura Rose, who is also a belly dancer and notable performance artist. Together, Laura Rose and Delilah produce new DVD projects and host dancers in all styles of belly dance in the studio as well as at her annual retreats in Hawaii (generally held in January and sometimes Easter). The retreats often offer an Instructors study program. Delilah travels and gives workshops around the world. Usually with the live music accompaniment of Erik Brown (of House of Tarab) and others. She also writes articles for belly dance magazines and, from time to time, leads tours abroad.